We’re just a few days away from the release of Shadow of the Tomb Raider, the long-awaited return of Lara Croft in her biggest adventure to date. We’ve been impressed by what we’ve seen thus far, but we can’t wait to dig into the rest of the game. And what’s more, one of you will be able to play Shadow in style, as Microsoft has teamed up with Square Enix to offer a very limited edition Xbox One X Shadow of the Tomb Raider console over on eBay, with 100 percent of proceeds going to charity. 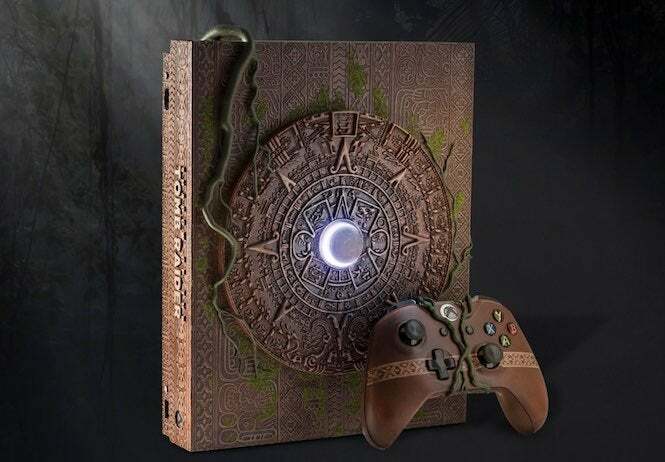 The console features a beautifully hand-designed piece of Mayan art with a light-up moon in the center of it, along with a Xbox One X controller to match. And it looks remarkable. However, if you are going to go after it, you might want to bring a deep checkbook. The current bid on the system is $5,700, with around six and a half days to go. Something tells us when this is all said and done, the system is going to draw a huge amount of money for charity. If that’s not your thing, Square Enix and Microsoft are also offering a number of Shadow of the Tomb Raider general Xbox One X bundles, autographed by Lara Croft's voiceover actress, Camilla Luddington. This includes a 1TB system, a controller and a copy of the game. There are three different bundles available, so you stand a good chance of winning with a high enough bid. We wish the bidders good luck. And we’re telling you, that special edition console would look lovely on our Lara Croft shrine at the office. Yes, a shrine. What, you don’t have one?! Shadow of the Tomb Raider releases on September 14 for Xbox One, PlayStation 4 and PC.